There has been lots of changes these last couple of months. After over seven years we said goodbye to our Totnes shop in April and moved our Internet operations closer to home in Callington. It was a sad farewell and our loyal customers were upset to see us go. Having been there longer than we've lived in any of our previous houses there was a lot of stuff to move. Despite having a sale to reduce the amount of stock we had to move, it still took us 3 days and nights of driving back wards and forwards to get it all moved. Blake sweeping up the last bits from Toyday Totnes. It only seems fair as I had to carry him around in my belly while we set the shop up all those years ago. Then came the not so small task of sorting it all out the other end. Our Callington offices are made up of lots of narrow rooms which all needed shelving to store all our toys. We just have Adam's office left to sort out but as he's busy on our latest project this is low priority. Our most exciting news is our new shop at Mt Edgcumbe. 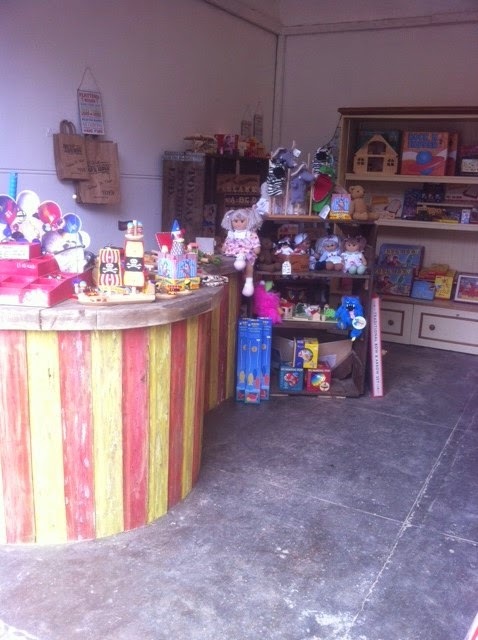 In just 5 days (and nights again) we have taken it from an old coach house into our Toyday Traditional toy shop of Mt Edgcumbe. A week ago you couldn't even get in there. It was a race against the clock to get ready to open today for the Smugglers Market. You can find us up at the Barrow Centre next to the Stables Cafe.